Look at wee baby Jodi at our first Malvern farmers market back in 2013! Our “Farm Store” is open randomly – but will always be posted as an event on our facebook page. You can also visit us by appointment only outside of those hours. We’re happy to accommodate to help you get your beef fix! We will also have “pop-up” hours for special dates and sales. You can find those on our facebook page. 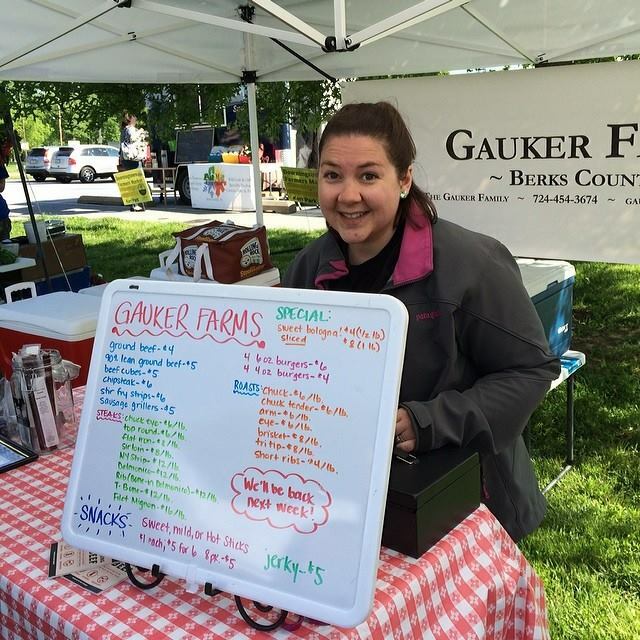 Downingtown Farmers’ Market – Every Saturday May through Thanksgiving from 9 a.m. to 1 p.m. in Kerr Park by the Veteran Memorial and gazebo on Pennsylvania Avenue. Address for GPS is 1 Park Lane, Downingtown. West Reading Farmers Market – New this year, we’ll be at the WRFM every other Sunday starting May 19. The market is on the 500 block of Penn Avenue and along 6th Avenue – right next to Say Cheese! Market hours are 9 a.m. to 1 p.m. The Antietam Valley Farmers and Artisans Market will run a summer market again! We”ll be at the winter market on May 20 from 5-8, and the summer market will continue to be on Monday evenings from 5-8 p.m. at the Antietam Valley Recreation Center, 905 Byram Street, Reading. The summer market begins June 3 and runs through August 26. Thank you to the Antietam Valley Community Partnership for their on-going support, and the (VOLUNTEER) market ladies that keep the show running. NEW! You can join our CSA or pick up a preorder at Crooked Row Farm Stand in Orefield, Lehigh County, on dates listed on our facebook events page. Jodi will typically will be there on the first Friday of each month from 3-5 p.m. You may preorder with Jodi and Liz will hold your order for pick up if you can’t make it during the pop up hours. Just ask! Also, find our beef on the menu at Nomadic Pies, Glenmoore Deli, and Saucony Creek Brewery and Gastropub! You can also find our sticks at The Meat House Chadds Ford, and our sticks are sometimes behind the bar at McArdles Pub and at The Nesting Box in Kempton. Be sure to check for any and all updates on Facebook! Hi, Jim! At Artisan Exchange, Paul will be selling our beef at the Stratton’s Wynnorr Farm stand from 10-2! Ground beef is $5 per pound and he will have patties, roasts, steaks, sticks, and jerky, too! Thank you for checking in!